Ben Simmons reportedly sought playing tips from NBA Hall of Famer Magic Johnson. 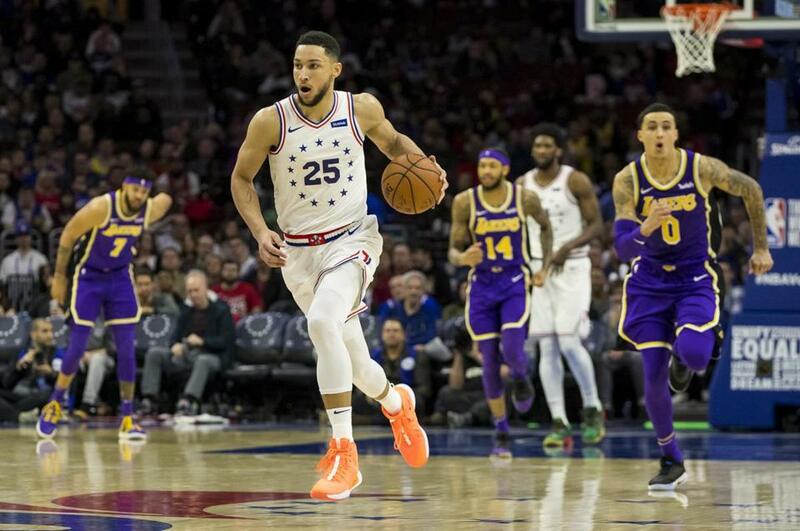 The NBA is going to investigate whether league rules were broken when Philadelphia’s Ben Simmons inquired about meeting with Los Angeles Lakers president Magic Johnson for playing tips. Johnson revealed over the weekend that Simmons had expressed a desire to meet, through an intermediary, and indicated that he would be willing to partake in such a session with the 76ers’ point guard if all parties involved granted permission . . .Russell Westbrook set an NBA record with his 10th straight triple-double in Oklahoma City’s 120-111 win over Portland. Westbrook broke a tie with Wilt Chamberlain, who had nine straight triple-doubles in 1968, by finishing with 21 points, 14 rebounds, and 11 assists. . . . Jeremy Lin is on the move again, the veteran guard announcing that he had been waived by the Atlanta Hawks and intends to sign with the Toronto Raptors. The Pittsburgh Pirates signed veteran outfielder Melky Cabrera to a minor league contract that includes an invitation to big league camp. Cabrera, 34, will make $1.15 million with an additional $850,000 available in performance bonuses if he makes the 40-man roster . . . Brad Brach and the Chicago Cubs finalized a one-year contract that guarantees the reliever $3 million and could be worth $8 million over two seasons. . . . The Athletics added depth at catcher, agreeing to a minor league contract with 35-year-old Nick Hundley. Free agent catcher Stephen Vogt is also headed to the Bay Area, agreeing to a minor league contract with the San Francisco Giants. The Los Angeles Kings have traded forward Nate Thompson and a fifth-round pick to the Montreal Canadiens for a fourth-round pick. The picks are in the 2019 draft. The teams announced the trade Monday before the Kings faced the defending Stanley Cup champion Washington Capitals. Thompson has four goals and two assists in 53 games for Los Angeles this season. He is a pending free agent who carries a $1.65 million salary-cap hit for the rest of the season . . . Blackhawks goaltender Collin Delia has agreed to a three-year contract extension through the 2021-22 season. The average annual value is $1 million . . . The New Jersey Devils have been awarded forward Kenny Agostino on waivers from Montreal. Tennessee remains No. 1 in The Associated Press men’s poll despite Duke’s earning the top overall seed in the NCAA’s initial rankings for March Madness. The Blue Devils received the top seed in the NCAA Division 1 Basketball Committee, but the Vols received 40 of 64 first-place votes from a media panel in the AP Top 25. No. 2 Duke had the remaining 24 first-place votes. No. 3 Gonzaga and No. 4 Virginia were the other top seeds in the selection committee’s rankings.
. . . West Virginia starters Esa Ahmad and Wes Harris have been dismissed from the team for undisclosed violations of athletic department policies. The Alliance of American Football, an upstart league attempting to fill a void during the NFL’s off-season, is off to a strong start. More than 2.9 million viewers tuned in to watch the league’s games on CBS Saturday night, topping the ratings for the NBA on ABC . . . Kevin Pyne, a 6-foot-8-inch, 280-pound left tackle from Milford High announced on Twitter that he has verbally committed to attend Boston College in 2020 . . . Add a schipperke, a long-haired dachshund, and a Havanese to the list of dogs who might become the first of their breed to the win the prestigious Westminster dog show. Colton the schipperke won the nonsporting group at Madison Square Garden, advancing to the finals. Earlier in the evening, Burns, a longhaired dachshund, and Bono the Havanese took their groups. More than 2,800 dogs in 203 breeds will compete over two days, leading up to the Best in Show award Tuesday night.